Instructor Training is on Saturday, August 18th in Atlanta, GA! 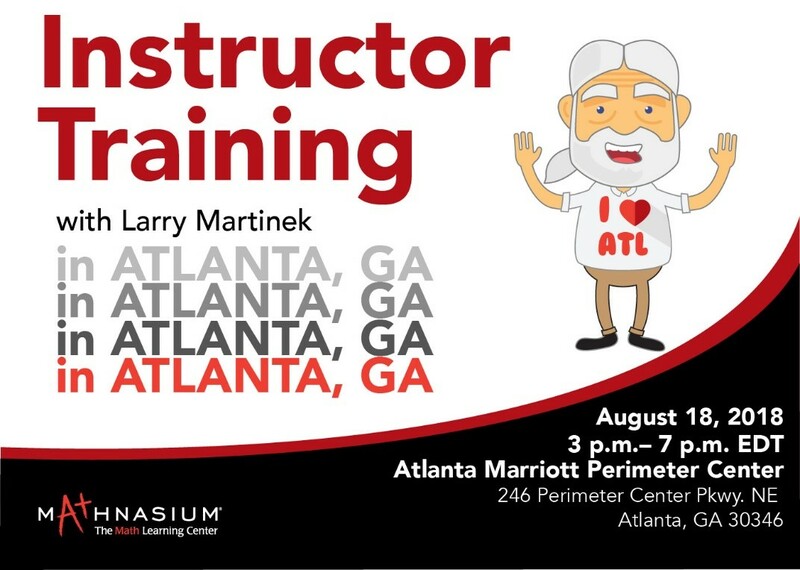 Larry and the Training Department are looking forward to heading out to Atlanta, GA in August for Instructor Training! Join them for an insightful time of knowledge and math magic! Our single-day Instructor Training is designed to educate, inspire, and motivate your Instructors. They will have an exciting opportunity to take their teaching skills to the next level—under the guidance of the master himself, Larry! NOTE: Franchisees and Center Directors, much of the material we are presenting on will cover topics already addressed at Initial and Center Director Training; however, if you would like to accompany your Instructors and join in, feel free to do so! To register for the In-Person Instructor Training in Atlanta, please follow this link to MU (you may be prompted to login) and click “Request”. You may also register by going to the MU Event Calendar on the MU homepage (bottom right-hand corner). Go to the desired training date and click on either the Online Instructor Training or (In-Person) Instructor Training links. Once you are in the Event, click “Request” to register. The registration deadline will be Friday, August 17, 2018. Required reading and assignments – All attendees must read Larry’s documents prior to attending. No user comments for " Instructor Training is on Saturday, August 18th in Atlanta, GA! "